Reddit user Johnnyjayyy2020 posted this picture on Reddit saying his girlfriend "saw this on her trip while in Alaska last summer! Anchorage Alaska." How would you title this group photo of these Jeep Wranglers? Looks like the yellow Jeep Wrangler wants to leave, but he will have to wait a while, was one of the comments posted under the picture. Someone commented saying this is the Jeep version of a group hug. 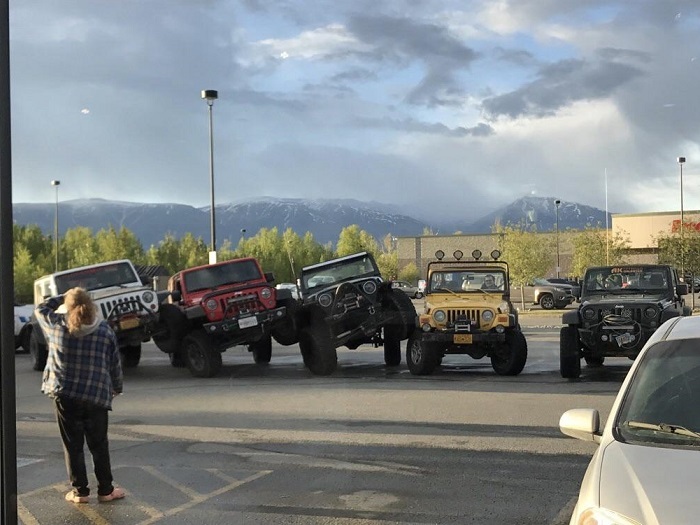 "Now I want to see enough Jeeps do this and make a connecting circle." Another person said that these Jeeps look like cheerleaders choreographing. Does it look like they are dancing? Apparently Jeep people do this a lot. Someone wrote about the gray Wrangler on the side. "The one gray one off to the side 'um... y’all are weird.'" If you live in Alaska do you recognize few of those Jeeps? How would you name this picture? Also don't miss these cool Jeep stories. Jeep wave at its finest. It's a stacking party for Jeep owners. Jeepers always lend a hand to a friend.